My initial plan for this week was to come with a Star Wars themed sequel, but in the end they dropped the part about a princess Leia and without the opportunity to draw some bikini and not get flamed for it, my enthusiasm decreased. A second option was to talk about one stage of the recent flame war (around the mixer), but that would be an unfunny personal attack, which my easily be seen as personal payback, so scrapped that too. Then an obvious (and predictable) topic was the recent release of a competing distro and our own preview release. Even if the angle was new, I felt I am somewhat repeating myself and put it on hold trying something else. I found the fourth subject attractive: a "fedora-flu" pandemic, which is expected to get global in less than one month an geeks wearing breathing masks to keep it under control. Still unsure I asked for feedback on #fedora-ro and the general opinion was the pandemic premise is good but it lack a good punch so better go back to the third option. I listened, implemented the graphics and here is Popcorn. Don't bother to flame me about how we are all supposed to be friends, hold hands and sing Kum-Ba-Yah. 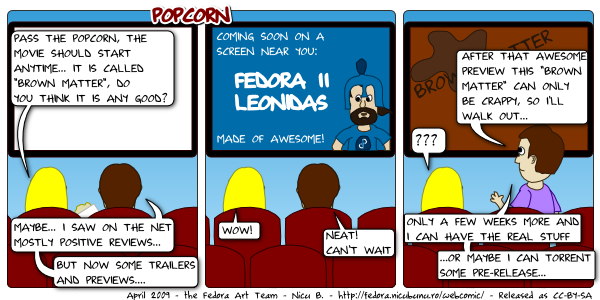 Fedora Weekly Webcomic: Level up!